The Circling Geese quilt block introduces the quilter to using flying geese units in the block (and I have to say, it is my favourite patch.) 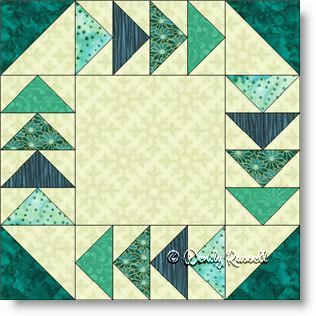 The flying geese patch is a very commonly used unit in hundreds of quilt blocks. The block also uses half square triangles and a square to complete the design. With careful piecing this is an easy quilt block to complete. The two quilt samples shown are very different, but the same block is used in both examples. By setting the quilt blocks on point, or side by side, two very distinct quilts emerge.